A century or so ago, G. K. Chesterton said “Journalism consists largely of saying ‘Lord Jones is dead’ to people who never knew that Lord Jones was alive.” Social media has made that sort of journalism a pastime in which all of us may share. On 12 June, the president of the Spokane, Washington chapter of the National Association for the Advancement of Colored People, a part-time college instructor named Rachel Dolezal, a person whose name, up to that point, may perhaps have been known to as many as 200 people outside the Spokane area, was revealed to be a white person passing for African American. Suddenly, Ms Dolezal became the most discussed person on Twitter and Facebook. Melissa Harris-Perry conducted a not-unsympathetic interview with Ms Dolezal, setting off a secondary social media firestorm from people upset with her for granting Ms Dolezal a platform. Countless right-wing voices equated Ms Dolezal’s “transracialism” with the lives of transfolk; some right of center pundits showed themselves surprisingly perceptive in critiquing this equation. Lefties objected that Ms Dolezal’s behavior trivialized the oppression that African Americans suffer. Some expressed that objection in a gentle way (see Keith Knight’s cartoon on the subject,) some in an angry way (see Tak Toyoshima’s cartoon,) and some with frank mystification (see Andrew Stewart’s essay.) Left, right, or center, gentle, angry, or confused, no one seemed to be able to keep quiet about this person who had been so obscure so short a time before that some commentators who had already said a great deal about her had the sudden, uncomfortable realization that they’d never actually heard her name spoken aloud. One of the reasons so many rightists were eager to make a connection between Ms Dolezal’s racial passing and transgenderism was that the same US media that suddenly filled with Ms Dolezal’s story last week had, the previous week, been dominated by coverage of Caitlyn Jenner’s announcement that she no longer wished to be known as Bruce. Most of this coverage had been quite celebratory of Ms Jenner as an individual and ostentatiously supportive of transgenderism in general. Many social conservatives were upset that something which they regard as so unwholesome was receiving so much favorable publicity. What struck me as strange was the fact that the long-retired athlete formerly known as Bruce Jenner was receiving so much publicity. After all, the last newsworthy thing she did was win a track and field competition in 1976. 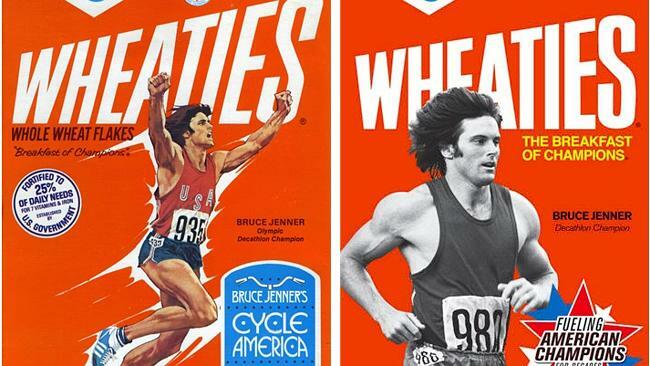 I suspect that if you had asked a thousand Americans, a couple of months ago, what Bruce Jenner was up to, the most common reply would have been “Who’s Bruce Jenner?” Certainly everyone under 40 would answer that way, unless their parents were antique dealers specializing in old Wheaties boxes. The second commonest reply would probably have been “Didn’t he die years ago?” All I can figure is that someone decided it was time to have a major transgender celebrity, and if the best they could come up with was a minor celebrity from decades ago, they would build that person up with all the force they could muster. Day before yesterday Ted Rall wrote an essay on this general topic of “celebritization.” It begins: “Even if you’re a news junkie, you probably never heard of Dave Goldberg or Beau Biden before they died. Yet both are at the center of a national mournathon.” That’s a bit of an exaggeration; as a military lawyer, Beau Biden was deployed to Iraq in October 2008, while his father was running for vice president, and that was very big news at the time. Granted, that was almost seven years ago, but I think most people who were paying attention to that campaign would remember it. Certainly it would be at least as fresh in the public memory as the 1976 Summer Olympics! And Dave Goldberg’s firm SurveyMonkey, which Mr Rall calls “a relatively obscure Silicon Valley startup,” has been a significant part of life in the Acilius household for several years, since Mrs Acilius is a sociologist who uses SurveyMonkey all the time. Still, it’s true that not a particularly large percentage of the US population were in a position to have experienced the deaths of either Beau Biden or Dave Goldberg as a personal loss. What’s weird – and make no mistake, it really is strange – is to see the deaths of unknown people elevated to national events simply due to their relationship with the rich and famous. If Biden died, I’d expect a state funeral. Sandberg merits an eighth of a page obit. Biden’s son and Sandberg’s husband? Not so much. Until 2014, high profile deaths followed high-profile lives. Now, you don’t have to accomplish anything, at least anything that makes a public impact, to be grieved by the public. If you want to be sad about someone you never knew about, much less knew, that’s your business. But I’ve got a question for you: when the celebrities go on and on and on about how fabulous the dead man or woman in question was, how on earth do you know if any of it is true? I’d put the sudden celebration of the, until then, long-forgotten Ms Jenner and the outrage over the, until then, totally obscure Ms Dolezal in the same category as the mourning over Messrs Goldberg and Biden. I’m inclined to be happy that so many people responded to Caitlyn Jenner’s introduction of herself to the world with warm expressions of support for transfolk, but how can we take those expressions seriously when they are bound up with the patently false idea that Bruce Jenner was still famous as late as this year? I’m inclined to share the concerns that left of center commentators have expressed about Ms Dolezal’s performance of race, but how seriously can we hope that public understanding of those concerns will deepen when they are attached to a figure whose prominence is so obviously ephemeral? In a couple of weeks, voters in the USA will go to the polls to fill a number of offices, including the electors who will either return Barack Obama to the White House for another four years as the country’s president or replace him with former Massachusetts governor Willard M. “Mitt” Romney. To be more precise, that is when the last voters will cast their ballots; millions of of Americans, Mrs Acilius and I among them, have already cast absentee ballots. The missus and I did not, as it happens, vote for either Mr O or his leading opponent. We had planned to vote for Ross “Rocky” Anderson, former mayor of Salt Lake City, Utah, whose independent bid focuses, first, on opposition to the wars the USA is currently waging or underwriting in Afghanistan, Pakistan, Syria, Libya, Mali, Mauretania, and heaven knows how many other countries; second, on opposition to “anti-terrorism” policies that have compromised the rule of law so drastically that Mr O openly boasts of murders he has ordered and plans to order in the future; third, on support for investigation and prosecution of any and all war crimes that recent US presidents have sponsored. But Mr Anderson did not gain sufficient support to be certified as a candidate in our state. So we voted instead for Green Party nominee Jill Stein. Dr Stein agrees with Mr Anderson on all of those points, but focuses her campaign on environmental policy and poverty issues. Many people like to say that, because Mr O and Mr Romney are the only candidates with any chance of winning next month’s election, votes for any other candidate are “wasted.” On its face, this expression is nonsensical. It isn’t as if the polling places were casinos where the machines pay out if voters cast a ballot for a winner. I have often asked people what they meant they say that votes for candidates unlikely to win are “wasted,” and have read many internet comment threads where people have been asked to explain what they mean by it. The response is invariably a repetition of the claim that some candidate or other is unlikely to win, usually accompanied by a lot of bluster asserting that it is a sign of some moral deficiency to vote for anyone other than a likely winner. Incoherent as these responses are, they seem to reflect a distinction that political scientists make between two kinds of voting behavior. They talk about “instrumental voting” and “expressive voting.” Instrumental voting, in its most basic form, represents a voter’s hope that s/he will cast the decisive ballot; expressive voting represents the voter’s attempt to make his or her policy preferences clear. Political scientists sometimes go to great lengths to defend the rationality of instrumental voting. Yet a moment’s reflection should suffice to show that in any election where the electorate is more than 600 or 700 people, the likelihood that there will be a single decisive ballot is quite small. In a race like that for US president, where over one hundred million ballots will be cast and the electoral process is indirect, the probability that the outcome will be decided by a single ballot is effectively nil. Meanwhile, if it is generally expected that the same electorate will vote again in the future and that such voting will be comparable in importance to the present election, political actors will analyze the results of the election as they formulate their plans for governing and campaigning. The more votes a losing candidate receives, the more likely the policies associated with that candidate are to receive serious consideration in the interval before the next election. Nowadays, the methods of analysis that parties, advocacy groups, candidates, and other political actors apply to election returns are so sensitive that even tiny numbers of votes can provide elected officials with information that they may profitably use in forming their approach to governing and campaigning. Therefore, it is not too much to say that expressive voting is in fact the only rational form of voting behavior wherever the electorate is larger than a few hundred people. What brought all this to my mind were three pieces I recently read dealing with the 2012 campaign. Two of them were from lefties exasperated with Democrats telling them that any vote not cast for Mr O is effectively an endorsement of Mr Romney’s worst proposals; these were from Ted Rall and M. G. Piety of Counterpunch. Another was from a right-wingers exasperated with Republicans telling him that any vote not cast for Mr Romney is effectively an endorsement of the misdeeds of the Obama administration; this was from Mark P. Shea. In particular, Mr Rall’s arguments, and even his presentation of them as a series of replies to Frequently-Asked-Questions, are remarkably similar to Mr Shea’s. Of course, the two are poles apart on most issues, but do unite in opposition to the idea of voting for either Mr O or his Republican counterpart. This morning, I came across this cartoon that Ted Rall published in April. Click on the link or on thumbnail below for the readable version at the site that’s paying him. I think there are some distinctions to be drawn here. On the one hand, it does cost money to degrade the environment. So businesses that cut costs in the ways Mr Rall here takes to task may in fact be reducing their environmental impact. Moreover, there are a great many uses of taxpayer money that benefit average consumers but are clearly bad for biodiversity, such as water subsidies. Both the public sector and private economic actors, then, can adopt many policies which would be at once good for ecological diversity and bad for economic equality. At the same time, there are economic actors who have great influence over the political system and who use that influence to distort markets to their advantage. So, a company that develops a product that consumers are not interested in buying may well manufacture some pseudo-ecological reason why its competitors should be forbidden to sell their products, and if it sufficiently well-connected may succeed in passing laws to that effect.